SAVE $13.70 with 7 piece set! Used to reduce the collet size for smaller diameter shank bits. Used for router bits, end mills, drill bits, and dremel bits. Never exceed the recommended RPM of the cutting tool. Complete set of all 7 sizes (except #243). I looked forever for some 3 slot reducers for my router to be able to use 1/8" end mill bits. I ordered item # 271 (1/4" to 1/8" reducer) and received a single slotted reducer. I am not happy about this at all as the run-out on the end mill will be significant enough to possibly break the bit during use simply due to run-out. Otherwise a good product. Haven't tested how well it holds 1/8" bits yet. I needed a few collet reducers so that I could use smaller end mills in my cnc router. I thought that I would try the collet adapters sold by MLCS. The adapters that I purchased did surprisingly well. There was no loss of concentricity with the one slot adapters that I had received. I highly recommend this part and I have in fact already recommended its use to the members of my growing Facebook group of like minded CNC router enthusiast. I ordered two #273 1/4 to 1/8 and was a bit disappointed because the items do not match the picture at MLCS. The two I purchased have only one slit, where the photo shows 3, which is a better design. Other than that, and some minor loss of concentricity, they work okay, and are worth the price. MLCS NOTE: The design is dependent on the size. Thinner walled adapters only require one slit. Thicker walled adapters require more slits for compression. The sample image happens to show a thicker walled example. Works great in my DeWalt 611, bought the 1/8 and 3/16 and both work GREAT. I am ordering a second set because ill use them so much on my cnc. By replacing your router bit's bearing with a bearing that has a smaller or larger Outer Diameter, you can achieve a different depth or profile. Please measure your bearings accurately before ordering. Now turn straight, groove forming, core box, dish cutter or V-groove bits into pattern/flush trimming bits. Put the bearing and stop collar over the shank and lock in place with the included hex key. 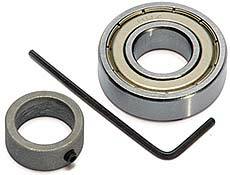 Bearing, stop collar, and hex key included.